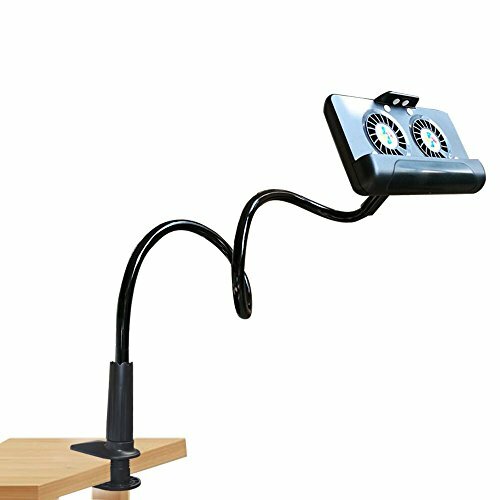 【Flexible Gooseneck Stand】 The cell phone holder can 360 º ROTATION to adjust the viewing angle; DURABLE CLAMP to ensures that your cell phone will stay securely fastened to your desk or other flat surface; RUBBERIZED GRIP prevent the desk or table from scratch. Flexible mount holder rod made of aluminum alloy, can be bent and folded. 【Power Bank】 The power bank with 4400mAh is built inside, it is about 8-15 hours for cooling only or it is about 2 times to charge the iPhone 6 Plus, iPhone 7 Plus and 1.2 times to iPhone 6 and iPhone 7. Very convenient to charge your phone when playing games or live broadcasting. 【Strong Cooling Effect】 It is perfect cooling effect based on the stepless speed regulation on double fan. It is quick to cool down your phone well when playing the intensive phone game or calling for some time. No screen halt, no screen delay any more. It is also extending your phone life. 【Double Stand】 The double stand is built in the back of the cooler, very stable when placed everywhere to release your double hands when watching movie. This is a very practical lazy mount holder. 【Seller's promises】 One-year quality assurance and lifetime warranty. If you have any questions, please feel free to contact us, and you are not need to bear any postage.